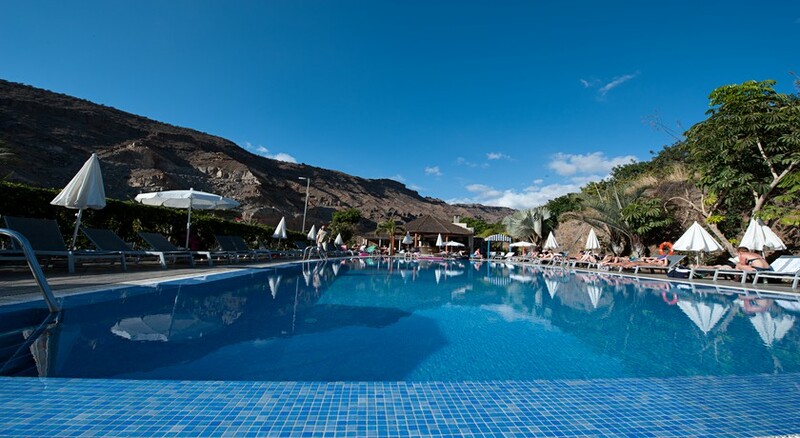 Set in the Taurito valley of Gran Canaria, the Paradise Costa Taurito is suitable for couples and families who are looking to stay in a relaxing all inclusive hotel with complete leisure facilities and a water park. It’s situated in a tranquil setting, roughly 200m away from the Taurito beach. Whether you’re looking for a fun-filled holiday with sports and entertainment or a relaxing stay near the sea, this gorgeous hotel is for you. Surrounded by flowers and cultivated plants, this stylish hotel houses the largest saltwater pool in Gran Canaria as well as a pirate ship and slides, perfect for kids. There is a buffet restaurant, pool bar and a disco pub on-site, where a variety of delicious food, refreshing drinks and light snacks are served to the guests. Gran Canaria weather is pleasant all-year-round, making it a hot choice for summer 2018 or a winter getaway. 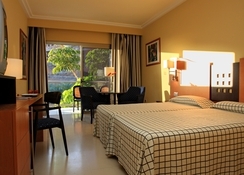 The hotel also provides car rental service to the guests from the Las Palmas airport and the airport in Gran Canaria. 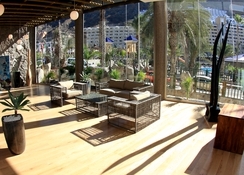 Situated in the Taurito resort, Gran Canaria, the Paradise Costa Taurito is 17km away from lively Playa del Ingles. The hotel is also based only 200m away from the gorgeous sandy beach, with the incomparable beauty and natural setting of the fishing village of Mogan nearby, too. Mogan fishing village is a 5-minute car or bus ride from the hotel. The Gran Canaria Airport is situated 52km away, while the airport in Las Palmas is 47km away from the hotel – so guests could travel from either. The Paradise Costa Taurito features spacious and modern rooms set amidst the gardens, where the guests can enjoy and relax the serenity. All the rooms – Standard, Family and Economy - have a functional design and include a terrace or balcony, satellite TV, telephone, air conditioning, mini bar, hair dryer, mirror, safe (extra cost), tiled floor, sink, bathroom and all the necessary amenities. The Standard Rooms can accommodate up to 3 guests while the Family Rooms and the Economy Rooms can accommodate 4 and 2 guests respectively. The hotel has a buffet restaurant serving delicious buffet-style food to its guests for breakfast, lunch and dinner. There is a Pool bar and a Disco pub, where you can relish refreshing drinks and light snacks from the menu. Additionally, there are a few restaurants and bars near the hotel. The hotel features great facilities including a swimming pool, wellness & spa centre, on-site gym, tennis court and squash court – so guests can be as active or as laid-back as they wish. If you’re on fun family holidays, the nearby water park makes for a great day out of the resort. Golfers will not be disappointed either, as there is an 18-hole mini golf area available, too. If you’re all about action and adventure, Paradise Costa Taurito offers water skiing facilities to the guests, which can be enjoyed throughout the yea. In the evening, a variety of night shows are arranged in the Bar arena plaza to relax and enjoy. These activities are suitable for both children and parents and the animation will be in english and spanish. From 15:30h there will be 6 group dances in the pool that is next to Katami Restaurant.This activity will last approx. 30 minutes. The animation team will be dressed up like pirates. From 16:00 h to 17:00h, the foam party will begin. This will take place in the solarium next to the Hotel Paradise Lago Taurito.